St Francis de Hieronymo Parish Cemetery. ​St. Francis de Hieronymo (St. Francis) Parish Cemetery is located one-quarter mile east of St. Francis Catholic Church on highway K-47. Use and upkeep of the cemetery is under the management of the St. Francis Parish Office. For information regarding funerals and burials, the purchase or sale of cemetery plots, or cemetery maintenance. CONTACT the Parish Office. All community cemeteries are historic. Each grave marker in a cemetery represents a final tribute to a person and the memories of that person's life. The collective memories represented by markers within a cemetery, especially an old historic cemetery, tell much of the story of a community's past. ​The collective story told by headstones in St. Francis Parish Cemetery is that of the earliest history of Kansas and the people who led our ancestors into this region. St. Francis is, by succession, the oldest cemetery in Neosho County known to have been used by white settlers and Native Americans. The cemetery was started in 1868 which dates to the earliest settlement of the Osage ceded land. The cemetery also includes graves that were relocated from an earlier Old Mission Cemetery on and east of Miles Field in St. Paul. As the town of Osage Mission was platted, removal of graves from that cemetery to St. Francis Cemetery, was requested by the Church. This was completed in about 1871. Those early graves included Osages, early settlers and at least three of the Catholic Mission missionaries. 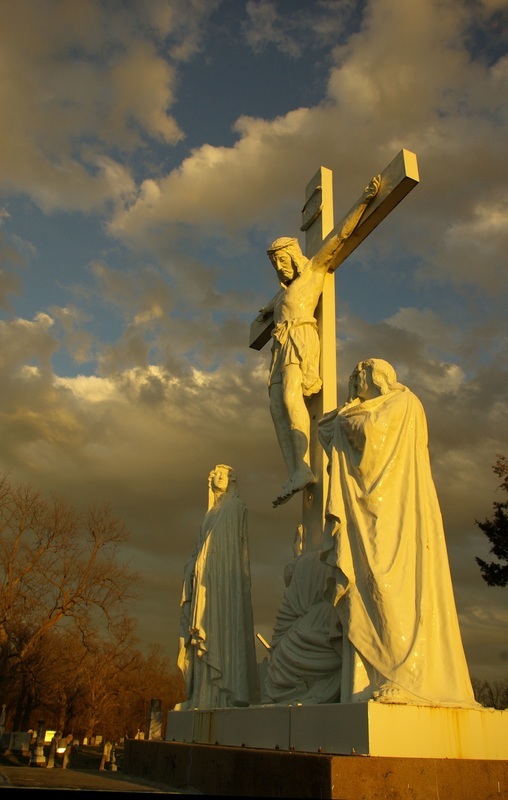 There are three distinctly historic fields in St. Francis Cemetery: 1) The Jesuit Field which is located directly east of the center crypt and crucifixion scene; 2) The Loretto Field which is located northwest of the crypt and 3) The Osage grave-site which is located along the northeast timber boundary of the cemetery. In addition to these fields the cemetery includes the graves of several Osage Mission town founders, Civil War veterans and many of our area's settlers. But most important, the gravestones and stories represented by them are the stories of our families, friends and loved ones. Please feel free to visit our cemetery but remember it is sacred ground. ​For more historical information about St. Francis Cemetery, including a satellite map showing locations of some of the areas mentioned above, follow this LINK. 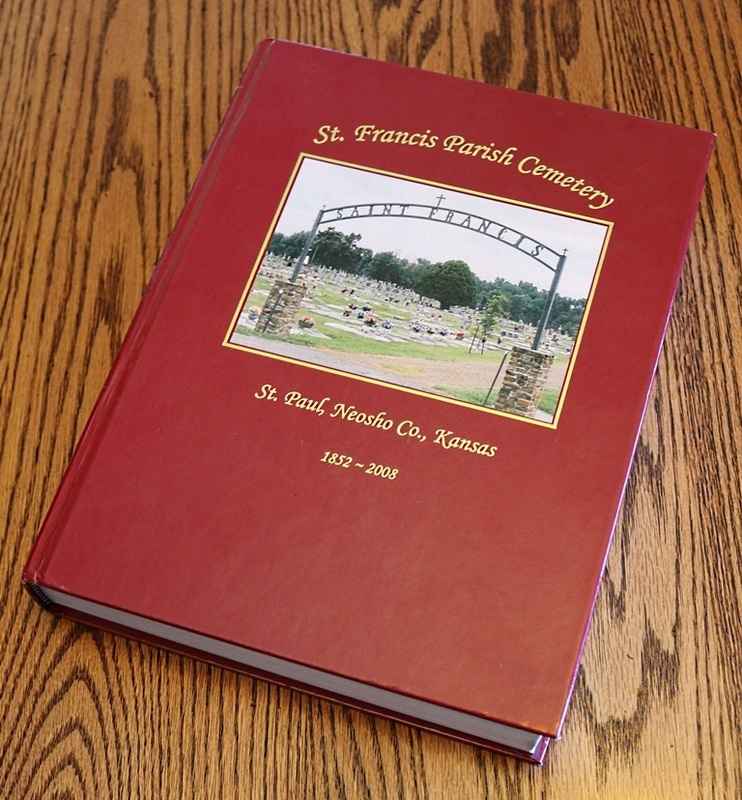 ​An excellent research source for the St. Francis Parish Cemetery is Viola Gouvion's "St. Francis Parish Cemetery, St. Paul, Neosho Co., Kansas, 1852~2008 (Copyright 2008)." The 672 page book should be considered to be a local treasure for the depth of information that is included regarding our cemetery, our ancestors and our history. The book may be purchased from the Osage Mission - Neosho County Historical Society.